The Federal Reserve’s efforts to rescue the economy have been historically aggressive, starting with the initial round of quantitative easing in 2008 and continuing through 2013. The central bank’s assets have skyrocketed due to the Fed’s bond purchases, which you can see clearly in this eye-opening report that Robert Prechter presented to the Market Technicians Association and his Elliott Wave Theorist subscribers. Download the full 8-page report for free here. The main reason investors are expecting runaway inflation is illustrated in [the chart above], which shows the value of assets held at the Federal Reserve. The Fed has been inflating the supply of dollars at a stunning 33% annual rate over the past five years. 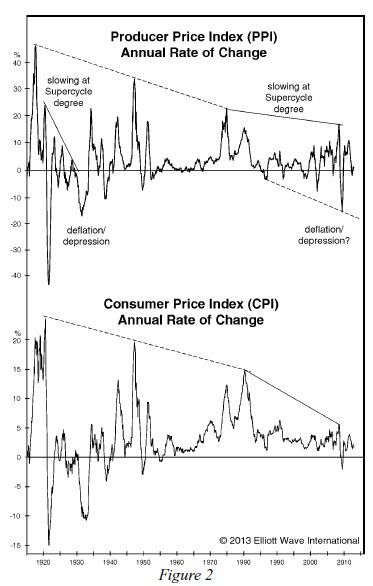 … [N]o wonder investors expect inflation and have aggressively positioned for it. In an interview at the recent San Francisco Money Show with financial author Jim Mosquera, EWI’s Chief Market Analyst Steven Hochberg explains why the Fed has gotten so little in return from its stimulus programs. Here’s a brief excerpt from the interview published on Aug. 18 on the Examiner.com website. You say they have been doing this furiously. They have been doing this historically! Yet if you look at inflationary measures, such as the Personal Consumption Expenditures, which is the Fed’s favorite way of measuring inflation, it’s bumping along at 1%. As the next leg of the bear market starts unfolding, they are going to do more unconventional things. Things will accelerate to the downside when the public realizes the central banks aren’t in control. Editor’s Note: In Elliott Wave International 8-page, free report they show how this relates to the CRB commodities index, Oil, Gasoline, Wheat, Soybeans, Corn, Gold, Silver, Copper and Real Estate. See it all in: How to Protect Your Money When the U.S. Debt Bill Comes Due. 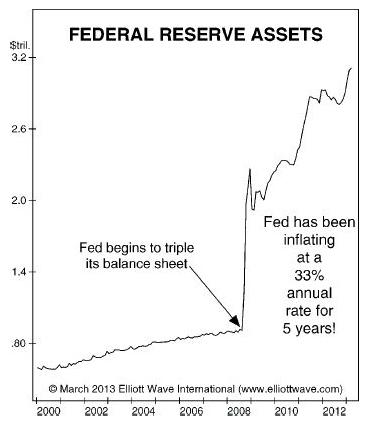 The Federal Reserve has been inflating the supply of dollars at a stunning 33% annual rate over the past five years. You don’t want to be unprepared when that bill comes due! Read this free report from Robert Prechter, market forecaster and a leading opponent of the Federal Reserve, and learn how you can protect yourself. As a result, you will understand today’s biggest risks to stocks, commodities, precious metals and the economy — risks that most mainstream sources cannot see because they’re blinded by decades of inflationary Fed policy. What’s So Bad about Shutting the Government Down? Taper Caper: The Consequences of Institutionalizing Q.E. This article was syndicated by Elliott Wave International and was originally published under the headline Deflationary Forces Stymie the Fed’s Economic Rescue Efforts. EWI is the world’s largest market forecasting firm. Its staff of full-time analysts led by Chartered Market Technician Robert Prechter provides 24-hour-a-day market analysis to institutional and private investors around the world.